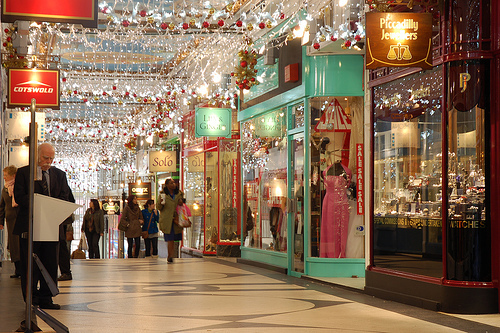 The trading that occurs in the run up to Christmas is very crucial to retailers even in the “normal” years. It allows them to make up for the losses they might have incurred over the year and helps them prepare financially for the coming year. 2008 has been, by any standards, anything but a normal year. Huge banks have become small banks, some have been swallowed up by bigger banks, some have merged with other banks while some have disappeared altogether. Little surprise then that the past few weeks have been really tense for the retailers. The number of shoppers visiting the shops have decreased. As a result, retailers have been forced to cut their prices to attract shoppers. According to Experian, the number of shoppers during the weekend, the last weekend before Christmas, was down by 8.7% as compared to last year. However, the number of shoppers yesterday were up 13.6% as compared to the same Monday last year. It’s a bit unfair to compare the two corresponding Mondays because last year the Monday was Christmas Eve. The kind of shoppers who go shopping on Christmas Eve are generally those looking for food items or ingredients for their Christmas dinner, last minute shoppers or those looking for last minute bargains. Even though the number of shoppers increased, it still remains to be seen how much revenue that translates into. The main reason why more consumers went out to shop perhaps has a lot to do with a last minute heavy discounts by retailers in desperate attempt to attract shoppers. According to the accountants Ernst & Young, the average discounts were 40%, up from 38% last year. It means that even though people had more shopping bags in their hands, the retailers wouldn’t have made a lot of money from that. Although the high street is seeing a decline in the number of shoppers, according to Hitwise, the number of people visiting the websites of high street retailers has increased. Between Dec 18 and Dec 21, traffic to online retailers(including internet-only and high street) increased by 2.2% on average as compared to last year. Websites of high street retailers saw their traffic increase by 2.7% on Saturday and 5.9% on Sunday as compared to last year. When it comes to prices, mostly the online retailers clearly have an advantage over their high street rivals. But their biggest drawback is that the items have to ordered before a certain date to ensure that they are delivered in time for Christmas. On the other hand, the websites of high retailers allow the shoppers to book their products online and pick them up instore. It may not be cheaper than the internet-only retailers, but it certainly is more convenient. One of the put-offs of shopping on the high street before Christmas is clearly having to navigate through crowded streets and aisles holding your shopping bags. It is also very hard to compare prices across different retailers and browse the items leisurely. The rise in the number of shoppers will definately be of some relief to retailers. But it will by no means make up for the dismal sales and revenues they have generated over the past few weeks. Woolworths and MFI have gone bankrupt and Whittard of Chelsea is said to be on the brink of administration. And it is clear that more will have the same fate in the new year, what remains to be seen is who they will be. Inflation? Worry about Deflation instead. It was announced today that the Consumer Price Index (CPI) fell by 0.4% from 4.5% in October to 4.1% in November. The CPI is the official measure of inflation used by the Government. The biggest factor for this fall is being attributed to the fall in crude oil prices. The average price of petrol was 95.2p. On the other hand, prices of fresh fruit and vegetables and non-alcoholic beverages is said to have risen compared to last year. Although the drop is good news, the rate of inflation is still twice the official target of 2%. So, Mervyn King, the governor of the Bank of England put pen to paper and wrote a letter to the Government explaining why the rate of inflation had not hit the target. The governor of the Bank of England is required to write a letter to the Government whenever the rate of inflation is either 1% above or below the target and explain the possible action the BoE might take to solve it. However, Mervyn King feels that the next time he has to write a letter to the Government, it may not be about the reasons for inflation, but deflation instead. What are Inflation and Deflation? Inflation is regarded to be a bad thing since it means a rise in prices, which is a bad thing for shoppers. Then, deflation must be a good thing, right? In the short term, yes it is. In the long term though, its a dreadful thing. To understand why a drop in prices is such a bad thing, one has to understand the meaning of the terms “inflation” and “deflation” and its causes. Inflation is the general increase in prices or, it is the decrease in the purchasing power of money. There are two possible causes; either the cost of production has increased, like the cost of raw materials or labour, or demand is out stripping supply. Take for example a rise in price of a NintendoWii games console. This may be due to a rise in the cost of materials and parts and workers who produce it. Or it could be that the number of units available is less than the number of people wanting to buy it, so the price goes up. Around Christmas, it is likely for the latter to be true. It wouldn’t be unusual around this time to find a NintendoWii on eBay at twice its retail price. Deflation is the persistent decrease in prices. This happens when supply outstrips demand which could happen due to a surge in productivity. Or, like in the current climate, consumers rein in their spending which means that shops have to cut prices to entice customers to spend. 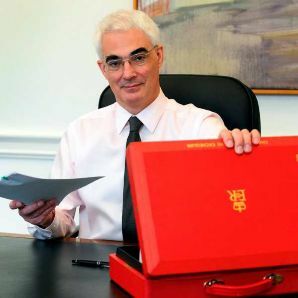 If this happens a couple of times, it creates an anticipation of further cuts in the future. So, although consumers may have the purchasing power, they postpone certain purchases since they would be cheaper in the future. Its a self-fulfilling prophecy where consumers postpone their spending thinking that there would be price cuts, and sure enough, shops cut the prices to persuade shoppers to loosen their purse strings. Good news for shoppers, bad news for businesses. Businesses experience cash flow problems and their staff would have to accept a pay cut or even lose their jobs. So, debt becomes expensive because one owes the same amount of money, but has less income to meet it. Signs of deflation can already be seen on the high-street. Retailers are offering massive discounts, the likes of which are usually seen after Christmas, because they are desperate to clear their stock. And the consumers know this and know that further discounts will follow eventually. It will be interesting to see how Mervyn King and the Government will go about coaxing the shoppers to spend their money. According to Andy Bond, the Chief Executive of ASDA, its now becoming cool to be frugal and not so cool to be frivolous and wasteful. He feels that consumer’s shopping habits are changing and a new generation of shoppers who are thrifty are emerging as the credit crunch begins to bite even further. So what does this really mean? It means that consumers will now focus more on products that offer them value for money and will aim to eliminate waste. Value for money doesn’t really mean something that is priced less or discounted. It is actually something that offers satisfaction and quality for its price. Consumers will increasingly try to differentiate their “needs” from their “wants” and think carefully if they really need something or do they just want it. For example, ASDA noted that consumers are beginning to shift from buying ready meals to buying ingredients and cooking at home. People are also beginning to mend or fix items rather than getting rid of them and buying new ones. Cobblers, for example, have seen their business increase since consumers are coming in to get their shoes mended rather than splashing out on a new pair. A quick search on Google Trends showed that visits to the comparison site moneysupermarket.com and myvouchercodes.co.uk which lists voucher codes across a variety of stores had more than doubled. What’s really interesting is the 40% increase in the number of people who are ignoring best-before dates and consuming the product rather than throwing it in the bin once it is past its sell by date. Perhaps the increase has also something to do with the numerous reports on saving money on television featuring people who regularly consume food, as long as it looks fit, well past the best before date. Consumers are also freezing leftover food rather than wasting it and sales of bottled water and smoothies has also been said to have decreased since many are opting to fill tap water and eat fresh fruit instead. It is important then that retailers spot this trend and adjust their business models accordingly in order to survive the downturn. Thrifty consumers would focus on long term value and would be willing to spend a little bit extra on an item that is likely to last longer than buy something cheaper in price which would also be cheaper in quality and hence not last as long. Rather than reducing prices on cheap Christmas stocking fillers that perhaps wont even last till next Christmas, retailers should instead focus on reducing prices on items that actually are of some use to the consumers. Also, thrifty consumers are less likely to buy items on impulse which retailers greatly depend on. So, businesses should make sure that they are really operating on a low cost model which aims to eliminate waste as that would be the only way that they would be able to offer low prices and good service at the same time. The high street retailer Woolworths, fondly known as Woolies, has been forced to go into administration after it failed to find a buyer to snap it up for a nominal £1. So, why didn’t anybody buy it, surely £1 for a whole company seems like a bargain? That’s because the buyer would have not only acquired Woolworth’s assets (things it owns), but also its huge liabilities (money it owes), £385 million to be exact. So, what is administration and when does a business go into administration? With regards to business, it is when a business doesn’t have enough funds to trade, also known a cash flow crisis. Cash flow is not the same as profitability of a business, but refers to the cash flowing into and out of the business. If cash coming in is less than the cash going out, then the cash flow is negative and it means that the business does not have enough funds to meet the current liabilities, like creditors and suppliers. However, going into administration isn’t still the end of the story for Woolworths. In fact, administrators, in this case the accountancy firm Deloitte, protect the company from creditors seizing stock to pay off the money that is owed to them. The administrators are trying to find a buyer for Woolworths, failing which it will be forced to go into liquidation. This is where the administrators try to sell off the assets to recover any money they can to pay off the debts. Woolworths competitors are dreading this because although it will mean less competition in the long term, since there is one less player in the market, in the short term, it will mean a price war during Christmas as the administrators will slash prices to sell off all the stock. So, is the reason for Woolworth’s difficulties due to the credit crunch? Well, the increase in household bills has meant that consumers are spending less. This is evident from the fact that Woolworth’s like-for-like sales have decreased whereas their costs have increased leading to increased losses. 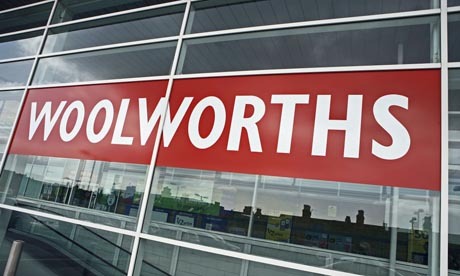 Many analysts say that Woolworth’s difficulties should come as no surprise, as Woolworths didn’t have a clear brand image, what its brand stood for, and its purpose in the market. Additionally, suppliers of Woolworths found it expensive to insure themselves against the risk that it wouldn’t be able to pay them and hence, Woolworths had to pay upfront for the supplies, unable to take advantage of buying on credit that some of its competitors enjoy. Woolworths has around 815 stores and employs around 30,000 employees. If the business does go into liquidation, all these employees stand to lose their jobs. Also, the businesses that supply to Woolworths will also suffer losses. The question many people are asking is why isn’t the Government bailing Woolworths out, after all, it did bail out the banks. Well, the Government can’t bailout every business in difficulty; it’s a natural business process where the one with the weakest business model fails hence making the others stronger due to decreased competition. Other than its retail business, Woolworths Plc. also owns Entertainment UK and 2Entertain. Entertainment UK specialises in the supply of CDs and DVDs to retailers such as Tesco, Zavvi, W H Smith, Asda, Sainsbury’s, Morrisons and of course Woolworths itself. EUK is said to be a profitable business and the administrators are looking for a buyer for it as well. If EUK is shut down, it will no doubt affect the retailers it supplies, especially during the crucial trading period of Christmas. BBC Worldwide and Woolworths Plc., on the other hand jointly own 2Entertain, and there are talks of BBC Worldwide buying Woolworth’s share of the business. It has also been reported that MFI is also going into administration, and it looks like a few more will follow, certainly after Christmas. If you want to see Woolworth’s Interim report for 2008, click here.